Thought we might like to have a place to post news items for Xbox360/XBL. Quote: This collection of multiplayer maps brings three brand-new battle arenas to the game and introduces a re-made version of a classic Gears map. Grind Yard is a sniper's playground, with low bunkers and high redoubts for those who like to pop heads. Under Hill features snowy tunnels, and Courtyard is a wide-open space that appears as if it will encourage face-to-face battles rather than a more tactical approach. Fuel Depot, a popular multiplayer map from the first Gears of War, will also make a return in the Snowblind Map Pack, but this time it will be snowed over. So bundle up and prime those active reloads. Along with Snowblind, Epic plans to release Title Update 3, a patch that will fix a number of outstanding issues online. Quote: ...the recently announced Versus Mode, which adds a competitive multiplayer aspect to the decidedly co-op-centric stuff supplied on the disc. Suddenly the lack of Mercenaries Mode's online multiplayer makes a little more sense, eh? The two supplied modes in the DLC piggyback off Mercenaries, using the unlocked characters there in a four-player not-zombie-killin' head-to-head game dubbed Slayer's Rule. By contrast, Survivor's Rule pits all those characters against each other in a more traditional deathmatch sense, providing a decidedly different experience from just about any other deathmatch game out there. After all, if you can't move when you're shooting getting the drop on someone becomes that much more important. Best of all, Versus Mode spoils unlock new weapons in the main story modes too, and offer a new batch of Trophies/Achievements to earn. Anyone heard any other exciting news?? First of all, we don't play GoW2 enough....maybe this will help! Secondly, now I absolutely MUST get RE5! 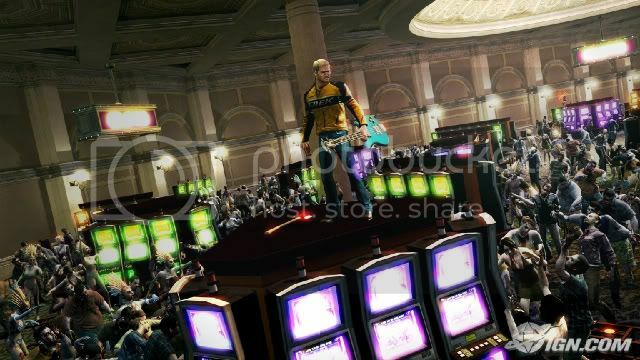 Quote: ...Dead Rising 2 will frequently track at least 800 separate clothing textures to provide the sense of unique zombies onscreen. What's more, thanks to the elements that Blue Castle are using from mental mill to quickly mass produce characters for the game engine, players could experience as many as 6000 characters onscreen during multiplayer sessions. If they pull it off, it could be awesome!! XBL has a teaser trailer for Call of Duty: Modern Warfare 2 up and the end of the trailer confirms that the release date is the 10th November 2009....hopefully this is a worldwide release date not just for the US! Call of Duty 1 coming to XbLA????? zombie67 Wrote: XBL has a teaser trailer for Call of Duty: Modern Warfare 2 up and the end of the trailer confirms that the release date is the 10th November 2009....hopefully this is a worldwide release date not just for the US! You'll notice that the words CALL OF DUTY appear nowhere in there. Just watch a couple of the Wolfenstein trailers and it is looking awesome! some nw games comming out.